Broad Beans are easy to grow, can be eaten in the pod when young, or shelled and is also a plant that puts nitrogen back into the soil. 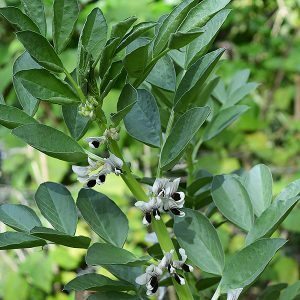 These attributes makes the Broad Bean a valuable addition to the vegetable garden. Being a cool season plant, they are excellent for planting after tomatoes and will help replenish the soil. They are also one of the easiest of all of the beans to grow. Sometimes known as the Fava Bean, Broad Bean Season, or planting time is from autumn to spring depending on the climate and the variety. Regarded as a staple in many Mediterranean countries they are increasingly popular in Australia. 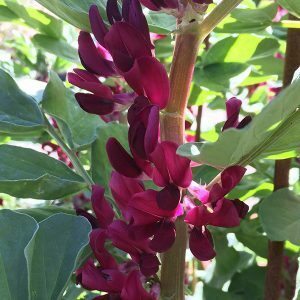 Best planted in a sunny position in a well drained soil, this is a tall growing bean plant that will need some support. These are a heavy cropping plant and they do come in a number of varieties, all easy care. Prepare the soil well before planting, dig in some well rotted compost, some cow manure and assume blood and bone. You can plant the seeds directly into the soil or start them in seed trays is you wish. Seeds are best soaked overnight before planting, use a liquid seaweed fertiliser for this. Broad bean seeds should be planted at around 20 to 25 cm apart and at a depth of around 5 cm. Water in well after planting and then hold back on the water until the seeds germinate, although not allowing the soil to dry out. Individual plants will need to be staked after they have reached around 30 cm in height as they can be very top heavy as they begin to crop. You can prick out the tips of the plants once they have reached around 1 metre in height. The plants are best staked after they have reached a good height as this makes them stronger. Some gardeners simply run a string around the patch of plants rather than stake individually. Harvesting can either be when the beans are young and the pods still tender, in which case you can eat the pods. Or if you harvest late, you will need to shell the pods and only eat the beans. Once the plants have finished cropping you can either dig them back into the soil, or compost them. Rotational Planting with Broad Beans. Plant then after tomatoes, capsicums, sweet corn or eggplants. These plants are hungry plants and deplete the soil of nitrogen, broad beans fix nitrogen back into the soil. Do not plant them in the same bed that you intend to use for summer growing beans as these also fix nitrogen. After Broad beans, follow them with carrots, leeks, or in fact just about any other vegetable that was not in the same bed before the broad beans. ‘Aquadulce’ – An old Spanish variety with large light coloured beans. Which is an overwintering variety. ‘Scarlet Cambridge’ – Old English variety with red to purple coloured beans as the name suggests. ‘Coles Dwarf’- Smaller growing than ‘Aquadulce’ however will still need to be stacked. ‘Crimson Flowering’ – You can grow this variety as an ornamental plant, brilliant red flowers in spring to summer on a tall plant to 1 metre in height. These are one of the easiest seeds to save..
Let some of the pods fully develop, and dry on the plant. Remove the seeds from the pod when dry. Store them in a cool dry position in a jar or in a paper bag. Replant them the next year. Pick the young pods and steam them. You can eat them whole. Older pods should be shelled and only the beans eaten. Lightly boil, shell and use then sauté them with butter and garlic to use on a Bruschetta with some feta cheese. Use them with peas, mint and a little pecorino cheese in a pasta.